Portland Industrial Demolition Services or Deconstruction: Which is Right for You? 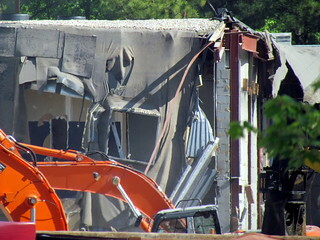 Just a few decades ago, demolition was really the only choice contractors and homeowners had when removing a building. Back then, green demolition had not yet been developed. Today’s industrial demolition services can offer both traditional demolition and deconstruction, which entails taking a building apart piece by piece, often by hand, to preserve as much as possible for recycling and salvage sale. So, which of these options should you choose: demolition or deconstruction? Well, the answer depends on your project and your resources. For the average homeowner who is remodeling or tearing down a home, deconstruction often makes the most sense. It allows you to recycle more fixtures and building materials. The price tag may be a bit higher for deconstruction, as it tends to be labor intensive. On the other hand, deconstruction often allows you to reuse some materials in your new project, saving you money and potentially helping you earn LEED points. (The eco-friendly LEED standard awards points for the reuse of old building materials). For earth-loving homeowners, the fact that deconstruction can help reduce this country’s construction and debris landfill stream is most important. The Census Bureau tells us that about 245,000 residential units and 45,000 non-residential units are demolished every year, creating about 74 million tons of trash. Rather than send your old home to the landfill, contract for deconstruction and recycle as much as possible. Old flooring, cabinets, appliances, fixtures, and even pipes can be reused in new building projects. Whatever you can’t sell may be donated to a local charity such as a Habitat for Humanity’s ReStore. Your donation of building materials will be tax deductible. You may assume that demolition is still the best option for industrial sites, such as old factories and power plants. Well, for modern industrial demolition contractors, the divide between deconstruction and demolition is beginning to blur. Most of today’s successful demolition companies specialize in both demolition and asset recovery—i.e., salvaging as much as possible from the old building to offset demolition costs. Machinery, metal, lighting fixtures and even concrete support can be salvaged from an industrial demolition project, along with much more. Rather than blindly swinging the wrecking ball, today’s demolition experts remove as much salvageable materials as possible prior to demolition. For instance, after winning the bid to demolish the Goldendale Aluminum Plant, a 1.2-million-square-foot defunct aluminum plant in Washington, Portland demolition contractor Elder Demolition went to work on salvaging efforts. Over 100,000 tons of concrete were removed from the plant. It took Elder Demolition about six months to remove rebar and cut down the concrete so that it could be repurposed into gravel using a concrete crusher. Elder Demolition also removed and recycled 35,000 tons of structural steel. Entire truckloads of equipment and building materials were salvaged and sold. Ultimately, just 2,000 pounds—about 1%—of the Goldendale Aluminum Plant went to the landfill. In the end, most modern demolition projects are a combination of deconstruction/asset recovery and demolition. Demolition—with the wrecking ball, high-reach excavators, and explosives—is still the best option for buildings that are condemned and unsafe for human entry. But before knocking down any building, it’s best to consult with a demolition expert like Elder, to learn about how much the old building might be worth, and to consider the environmental consequences. This entry was posted in Asset Recovery, Scrap Metal Demolition, Scrap Metal Recycling, Steel Processing and tagged demolition asset recovery, green demolition, industrial demolition contractors, scrap metal, scrap metal recycling. Bookmark the permalink.